Hi, my name is Jeff Anderson and I’m Editor In Chief of Modern Combat & Survival Magazine and President of the International Society of Close Quarter Combatants. As a combat veteran of the U.S. military, I’ve dedicated my life to help others achieve the confidence and level of preparedness to protect themselves and their loved ones from any crisis, disaster or physical threat. The first thing I suggest you do is to prepare your “bug-out bag” – your ready-to-go gear and provisions in case you and your family are forced to evacuate your home in an emergency. Most people overlook this critical component of their self-protection plan… and others just get it completely wrong and put their family in danger due to improper gear and dependency on government provisions that are often scarce. The responsibility is yours to provide for yourself and those who count on you in an emergency. Don’t get caught unprepared! 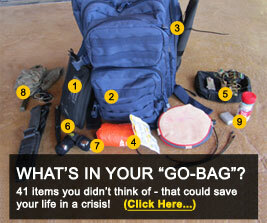 Click the big button above and let us show you the right way to prepare your “bug out bag” now so you’ll be ready at a moment’s notice to evacuate and survive when your loved ones need you the most.